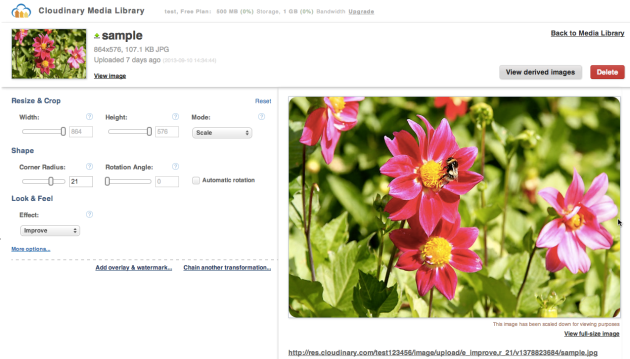 Cloudinary is an end-to-end image management solution for your website and mobile apps. Cloudinary covers everything from image uploads, storage, manipulations, optimizations to delivery. 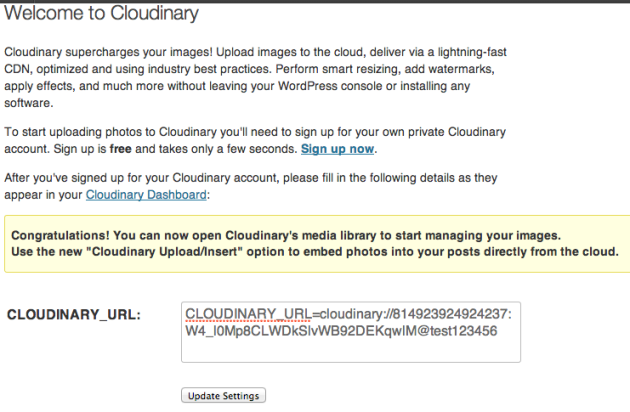 To start uploading photos to Cloudinary you’ll need to sign up for your own private Cloudinary account. The free plan gives you 500MB storage, 50,000 images and 1GB monthly bandwidth. These figures are great for small to medium sized blogs, depending of course on your use of images. Image intensive sites will need to sign up for the premium plans soon enough. Once you sign up you will get a license key which you need to paste back into the Cloudinary settings screen in your WordPress installation. With that settled, you are ready to go. 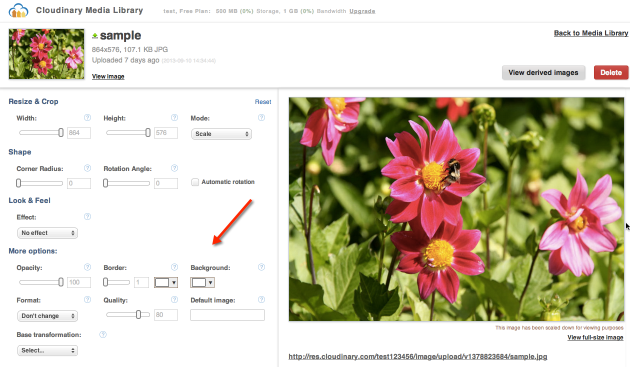 Cloudinary adds a new menu item to your dashboard, and on accessing that page you will see the interface shown below. Basically here you can upload the files (it works similar to the WP image uploader) or search images which you uploaded earlier. Click on any of the images and you’ll be taken to the image editor. If you’ve been reading my plugin reviews, you know that I’m a stickler for plugins abiding by the WordPress UI standards. As you might have noticed, Cloudinary has a custom interface, which I would normally frown upon. However, this plugin is a good example for showing when it is a good idea to go for a totally custom interface. It makes sense in this case because it is quite a complex plugin, and thus needs to break out of the limiting constraints of the WordPress standard UI. In doing so, however, the Cloudinary guys have kept in line with the spirit of the WordPress UI, giving us a clean, non-obstrusive interface that just lets us get on with the job of editing and publishing our images. So kudos to them for a good interface! One final thing about UI. Cloudinary can be quite a complex plugin if you make use of its more advanced features. This has been taken care with help sprinkled throughout the interface. Next to each option you will see a question mark icon. Click it and you’ll get a popup giving you a quick brief about that piece of functionality. Very nicely done. From the features listed above, I think you get the idea about what a feature-rich plugin/service Cloudinary is, but I’d like to reiterate what an immense feature set you are getting when installing this plugin. Check out the screenshot below showing the full option set in expanded view. If this isn’t enough you can take a look at the API in the documentation section, lots of things you can do simply by changing the format of the requesting URL. Amazing stuff! Cloudinary’s documentation is both comprehensive and easy to understand. There is a lot of material covered, including specific integration instructions for Ruby on Rails, Django, PHP and other languages. 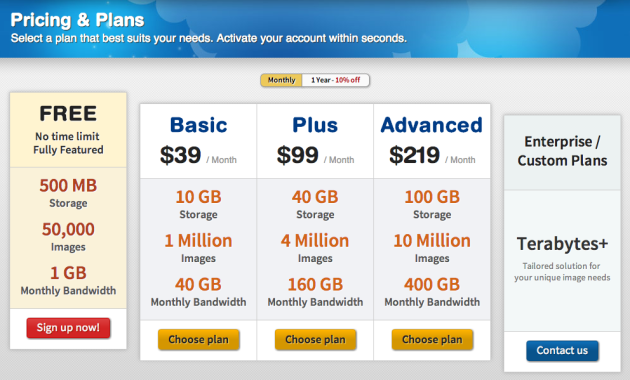 Pricing for Cloudinary begins with the free plan and goes all the way up to Enterprise / Custom plans. The free plan will be outgrown by most blogs having a decent amount of traffic, but the Basic plan at $39/Month is quite generous. For the higher priced plans, needing that amount of storage means that you are probably making decent returns from your blog and can thus justify the cost of the Cloudinary plan. Considering the usefulness of Cloudinary’s service, I think the pricing is very intelligently structured, and also fair on its users. Want to promote Cloudinary to your peers? You have an extra incentive for doing so, as you can benefit from upgrades to your account when doing so. 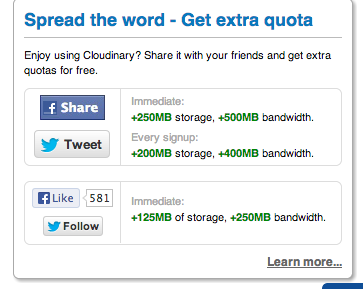 For example, if you share Cloudinary on Facebook, you’ll immediately get +250MB extra storage, plus 500MB extra bandwidth. I’m sure many users will take advantage of this offer. This kind of service might be somewhat of a novelty to WordPress users, we’re used to upload images via the WordPress uploader and not think twice about that, right? So what are the real benefits of Cloudinary for WordPress users? First up, storage. I invite you to use your FTP client and check your uploads folder. See how many version of an image WordPress creates upon upload. And see how many MBs images are occupying on your server. On a decent sized blog or website, there will be a lot of images, each having different size variations, and they will consume a lot of server space. 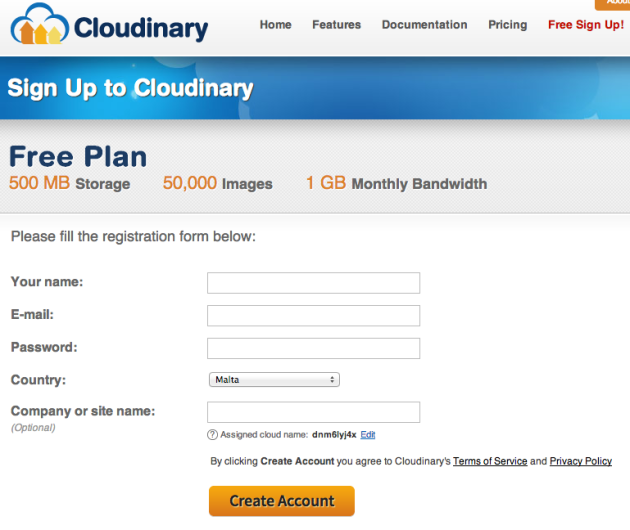 Therefore, using Cloudinary will free up all that space on your server. Secondly, processing speed. Whenever you are uploading an image and applying transformations (such as resizing), you are using the server’s processor to perform those tasks. When using Cloudinary, you free your server from such operations, leaving it to do what should be its main focus, ie serving web pages as fast as possible to your site visitors. What about the wealth of transformations that Cloudinary offers? With the native WordPress image uploader, you can only scale images. However, with Cloudinary there are loads of effects you can apply (Sepia, B/W, Brightness etc.) plus you can of course resize, rotate and do a whole bunch of stuff. And remember, all this is processed on Cloudinary’s server. You can thus change your website design and have all your image sizes changed without having to regenerate them on your WordPress site. Serving images from Cloudinary’s CDN will also probably speed up your website, and free it from the bandwidth-munching image resources. This is a very important consideration especially for those of you who are on limited shared servers. This is an excellent plugin that should be on the priority list for most people starting new WordPress blogs. Would you like to feature your plugin or theme on WPMayor? Check out our sponsored post and paid review service page. Sensei Review - Learning Management made Easy! I was wondering if Cloudinary can be used in conjunction with Amazon Cloudfront. Also, is there a way to configure it to upload to the cloudinary server if the images are uploaded via the front end with tools such as Gravity Forms or Cred from wp-types? I tried Cloudinary out a few weeks ago but it caused a major spike in CPU usage on my shared hosting account and got my account restricted for a time. It was a real pain to transfer all of my images back from Cloudinary because the process kept giving me error messages. I suspect it was a plugin conflict but I’m not going to try it out again any time soon because of it. I don’t think my hosting company would be too pleased in any case! Nice review but you forgot to mention that this service ils far from mature and lacks major ans basic features as file management. Nothing happened since this review. Paid promotion is good but at least give it some in depth experiment. Cannot access Cloudinary (error couldn’t connect to host) – Verify your CLOUDINARY_URL?? ?